During a bushfire it is unlikely town water. If there is still water the pressure will be much lower than normal. So we installed a 25,000L water tank which is kept filled from town water by a float valve. The tank is connected to our fire pump only. As it is never used for any other purpose it is always full. The Bushfire CRC did test various water tanks by subjecting them to complete flame immersion for 30 minutes. Apparently steel tanks remained intact while plastic tanks did fail. Thing is, I have not seen the full report, and the bits I have seen (Update - Tanks on trial) do not say how long the plastic tanks did last. 30 minutes is a long time for complete flame immersion. Bushfires are not like building fires in that they burn up their own fuel quickly, the full front is short lived. I'm told about 10 minutes. So it is hard to see the full relevance for our need of a 30 minute full flame immersion test. If the flames are from an adjacent building, then it is just too late to use the water anyway. I did not go for a fibreglass tank as I was told they are brittle. A falling tree or branch will destroy a fiberglass tank. Falling trees are common in our area so that is a high risk. 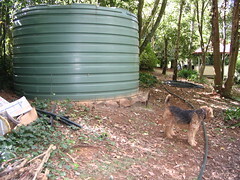 The size of the tank was determined by our need to protect our dogs when we are not home, we do not need such a large tank to stay and defend but having so much water will definitely make it easier. 60lpm for 7 hours = 25,200 litres. We have to assume that we may be able to start the pump but not stop it as telephone lines may be damaged by fire. Given the problem of judging just when to start the system and that an ember attack my last hours, 7 hours seemed like a minimum time period for us. We do not have any 'no flow' sensor in the pump's intake line so if it does run dry it will be damaged. But by that time it has done all it can do anyway.